I’m thinking about getting a tattoo. I’ve been thinking about this for awhile, and I haven’t laughed off the stupidity of the idea yet, so I think this idea is going to translate into actual ink on my body. One day – when I forget that tattoos mean enduring needles and sleazy motorcycle dudes w/intentionally bald heads. And perhaps when I’m under the influence of an illegal substance, or at least, a lot of liquor. I’ve have thought up a design in my head. 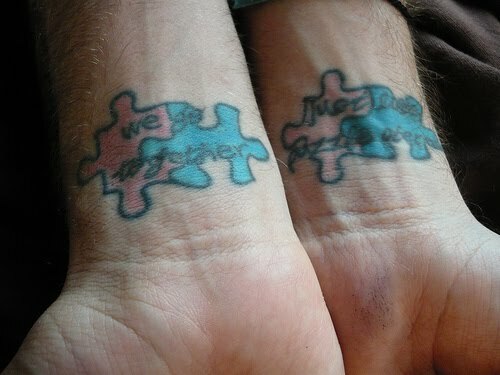 It’s two puzzle pieces that fit together. And one piece has an “H” and the other an “S.” Because just last night Steve reminded me that somehow, him and I just work. Even though we’re so different and no one would ever think to match us up on a blind date w/each other, something about us just fits. We get each other. And the other reason is because, as you all know, I’m a freak about puzzles and most things nerdy (not video games + sci-fi super-geek nerdy, just homeschooled-word-girl nerdy. I mean, hey, I actually wanted glasses as a kid [still kinda do, actually]). I would like the puzzle pieces to have actual interlocking designs though and be multi-colored, but the same basic concept. But I’m a chicken. And I’m sober. So it certainly isn’t happening right now. But sometime, I’d like it. I’ve always admired tattoos on the people that do them right. Not the pointless black sleeves or Chinese symbols or collages of stars and butterflies, but the tattoos that actually represent something. What about you? Do you have tattoos? Did they hurt? What advice can you give to a tattoo virgin to make the first time’s pain more bearable? make sure to get one you love and has meaning. i hate when people get tatoos just to get one. like that buterfly on your hip you got on spring break is original.